Phalke must be passed on with the Vishwanath Award! If there is a latest development in the film industry, the whole world responds in a certain way. Sensational Ram Gopal Varma responds in a different way. Most people can not even think there's such a point of view. Although his comments seem controversial and satirical .. usually there will be some logic. 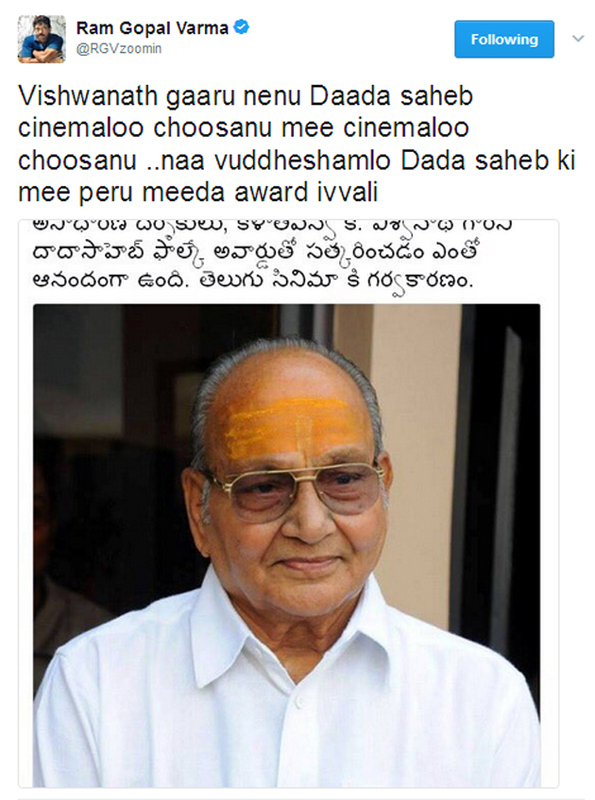 In a recent development, K. Vishwanath was awarded the Dadasaheb Phalke Award .. and RGV did not wait much to express his opinion. He said he watched Dadasaheb movies and Vishwanath movies. Instead of awarding the Dadasaheb Phalke Award to Vishwanath, Phalke should be awarded with the Vishwanath award. His first tweet is enough to understand the fact that Vishwanath is a much better filmmaker than Phalke. He continued with his satirical touch. People of this generation would not even have seen any Phalke movie. Thus, Raju Hirani Award of Karan Johar would be more relevant. Although Phalke made 95 films in his career, Varma stated that he did not even make a single movie equivalent to a Karan Johar movie. He concluded that it is old and old does not mean great .. and we should not ignore the value of current generation of movies. While saying that it's not a respect for Phalke .. he said he loves Karan Johar movies more than Phalke films.